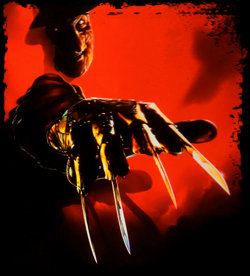 On November 2, 1984, the nightmare began in the town of Springwood, U.S.A. when the innocence of Elm Street was violated for eternity. The Springwood PTA ignored their children’s claims that an evil man named Freddy Krueger was the Dream Monster responsible for the mysterious and often violent deaths of their friends. The PTA knew the Krueger name, and they knew he was a killer once. They also knew that Freddy Krueger was killed in a vigilante action that many of them participated in; how could he possibly be responsible for the inexplicable terror plaguing Springwood’s youth? With Freddy’s Dead: The Final Nightmare, they’ve saved the best for last. Evil dreamstalker Freddy Krueger is dispatched forever in this thrilling, final installment of the phenomenally successful Nightmare series. The trademark striped sweater, fedora, and metal rapier hand are gone for good, and Freddy’s fire-scarred countenance along with them. Time and time again, the recurrent and inexplicable terror of Freddy Krueger has gone to battle in the unconscious dream world of Springwood’s youth. With each apparent defeat, and with each renewed sense of security, there lies the uneasy threat of Freddy’s nocturnal return to Springwood. Now, with all the children gone, and the entire community of Springwood completely repressed by the controlling influence of Freddy’s evil spirit, it’s time to end his reign of terror. It’s time for a real battle with Freddy Krueger. Not to drive him back or to control his strength. Not to become more powerful than he is, but to put an end to him. Once and for all, it’s time for The Final Nightmare.